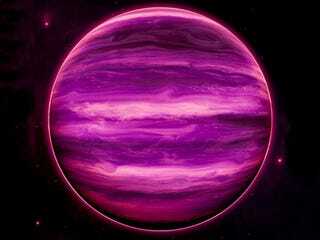 This beautiful purple jewel is an artist rendition of W0855—a Jupiter-sized brown dwarf 7.3 light years from Earth. If the scientists who just published a new paper on its composition are right, it's the first object outside the solar system in which we have observed water clouds—an amazing discovery. I've been obsessed with this object since its discovery. I went to battle at the telescope to try and get this detection. I wanted to put war paint under my eyes and wear a bandanna, because I knew this was not going to be an easy thing to do. At the telescope, I've never been so nervous. I've never wanted clear conditions so badly [...] I'm absolutely elated. After there nights manning the 6.5-meter Magellan Baade telescope in Chile, the team managed to get 151 near-infrared images that finally resulted in the positive detection of water clouds. According to University of California, Santa Cruz, Jonathan Fortney, "it's tentative [but] "it's the first evidence for water clouds" outside Earth and Mars.